Have you ever had a song you can’t get out of your head? I have had this silly song from Veggie Tales playing over and over in my head… called “I Love My Lips”. Poor Larry, the cucumber, has lost his lips and sings how much he loved his lips. These two horizontal planes of tissue allow you to do so much- to nurse as a baby, to whisper, to talk, to whistle, to kiss, to eat, and to smile. I will not take for granted my lips anymore. 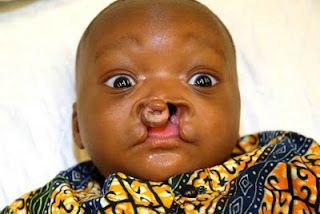 As I assisted our max-fax surgeon, Dr. Tony, shared with me that all of us in the womb have cleft lips. So from the corners of your lips and the sides of the roof of your mouth- cells form tissue that grows toward the midline to form your lip and palate. 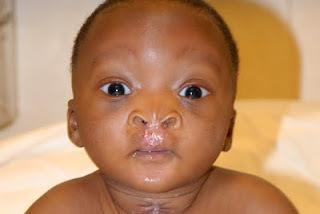 Sometimes that tissue never meets in the center and babies are born with a gap under their nose, also known as a cleft lip. Dr. Tony brought many children from a village north of Lome’, ranging from three months to 13 years old. We have heard of babies being abandoned and children being outcast because of these deformities. However, on the Africa Mercy they are loved, held, kissed, and admired by all that see them on the ward. Wednesday I worked in the operating room fixing these lips, Thursday I cared for them in recovery, and Sunday I worshipped with them at ward church. Their new smiles make your heart melt even more when you first meet them on the bench before surgery. In recovery, I held a precious little one- that was not even born when we arrived in February in Togo, but God knew we would be here to fix his lip in May. I saw kids reach up to feel as mothers admire their children’s new faces. It is hard not to fall in love with these babies with “whiskers”- just the bandages that are placed on the stitches holding their new top lip together. After this week fixing cleft lips with Dr. Tony, I can now relate with Larry and with our patients. I love my lips too… if I lost them, I would miss them. What a sweet, sweet post! And how wonderful to be able to be part this!! thanks so much for sharing it!